A building’s central air conditioning system must be periodically inspected and maintained in order to function properly. While an annual inspection performed by a trained professional is recommended, homeowners can do a lot of the work themselves by following the tips offered in this guide. The exterior condenser unit is the large box located on the side of the building that is designed to push heat from the inside of the building to the outdoors. Inside of the box are coils of pipe that are surrounded by thousands of thin metal “fins” that allow the coils more surface area to exchange heat. 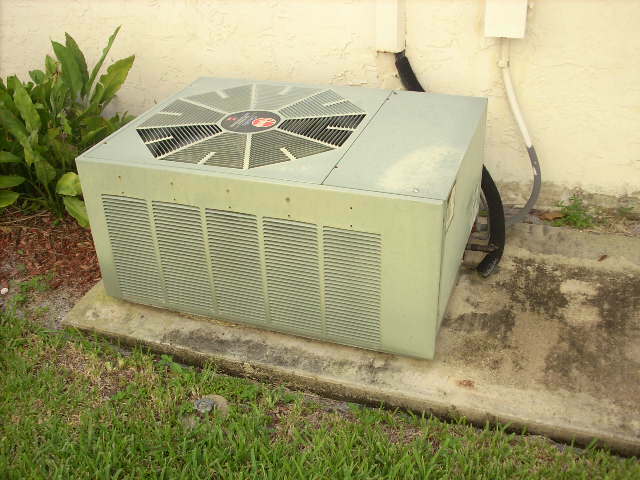 Follow these tips when cleaning the exterior condenser unit and its inner components — after turning off power to the unit!Remove any leaves, spider webs and other debris from the unit’s exterior. Trim foliage back several feet from the unit to ensure proper air flow. In summary, any homeowner can perform periodic inspections and maintenance to their home’s central air conditioning system. If you have any questions or would like to get a recommendation on a qualified, trusted HVAC contractor you can send me an e-mail @ allpointshomeinspect@yahoo.com or call me @ 720-670-0366. Here is a brief rundown on the new lead paint law. $37,500 per day, per incident. Anyone disturbing more than 6 sqft of interior paint, or 20 sqft of exterior paint, or any window replacement. Fix and flippers doing the work themselves, even if the home is vacant. Property managers having work done on any rental unit, even if it is vacant. Owners who manage their own rental property. Certified Renovator must test prior to work, supervise work, and certify clean up. What must happen during the work? ”Renovate Right” booklet must be given to any occupant and signed disclosure at the back filled out. Warning must be posted during work, and public / occupants are not allowed to enter work area. Renovation area must be sealed off from other parts of the home. Lead-save practices must be followed during work. Forced air heating and A/C must be turned off in work area (vents sealed to prevent spread of dust). Clean up must be done with HEPA vacuum and all clean up must be certified. Owner “Occupants”, that certify that no children under 6, or pregnant women live in the home. Key word is occupants, thus why fix and flippers are not excluded since a child or pregnant woman may purchase. Emergency repairs on areas that would be a safety hazard, or create more damage if not immediately repaired. What impact does this have on Brokers? First, inform your investors, clients and contractors on this new law. Lead Paint Disclosures on renovated homes will need to include “knowledge” and “reports” if they exist. ”Don’t Know” and “Have No Reports” will be a red flag if it is obvious walls were moved or exterior was scraped. About 2.5 million children are injured or killed by hazards in the home each year. The good news is that many of these incidents can be prevented by using simple child-safety devices on the market today. Any safety device you buy should be sturdy enough to prevent injury to your child, yet easy for you to use. It’s important to follow installation instructions carefully. In addition, if you have older children in the house, be sure they re-secure safety devices. Remember, too, that no device is completely childproof; determined youngsters have been known to disable them. You can childproof your home for a fraction of what it would cost to have a professional do it. And safety devices are easy to find. You can buy them at hardware stores, baby equipment shops, supermarkets, drug stores, home and linen stores, and through online and mail-order catalogues. A pre-listing inspection can be available at the property for review by the buyers after viewing the property. The listing agent should also have the inspection report available for prospective buyers and their agents through an HTML link on their website. •	Identify defects and make repairs ahead of time. By identifying possible defects early on, the seller is in a position to handle repairs prior to listing, making the listing more attractive and the property more saleable. This may mean more money to the seller and a faster sale. Making repairs ahead of time will limit objections over defects during the negotiations. If the seller elects not to repair certain defects that turn up in the inspection, they can disclose the defects to potential buyers in the disclosure documents. State disclosure laws vary, and sellers should consult with their attorneys on state disclosure laws. •	Aid as a pricing tool. Having a completed inspection report from a certified inspector will help you (the seller) arrive at a realistic list price. If you find out, for example, that your HVAC system shows significant wear and tear and will need to be replaced before the next winter season, you should take that into consideration when pricing your home for sale. •	Provide a feeling of confidence to potential buyers. With a clean inspection in hand after viewing a property, potential buyers may feel more comfortable in moving ahead with an offer. When a buyer can see there are no major defects in the property to be addressed, it is easier for them to determine how much they can comfortably spend on the house. If there is a problem that needs to be addressed, they buyers can write an offer that will reflect the cost of the needed repairs, or they can ask the sellers to remedy the defect. Federal, state, utility and local jurisdictions’ financial incentives, such as tax breaks, are very advantageous in most parts of the U.S.
Demand water heaters (tankless or instantaneous) provide hot water only as it is needed. They don’t produce the standby energy losses associated with storage water heaters, which will save on energy costs. Demand water heaters heat water directly without the use of a storage tank. Therefore, they avoid the standby heat losses required by traditional storage water heaters. When a hot water tap is turned on, cold water travels through a pipe into the unit. Either a gas burner or an electric element heats the water. As a result, demand water heaters deliver a constant supply of hot water. You don’t need to wait for a storage tank to fill up with enough hot water. Windows can be weatherstripped with a special lining that is inserted between the window and the frame. For doors, weatherstrip around the whole perimeter to ensure a tight seal when closed. Install quality door sweeps on the bottom of the doors, if they aren’t already in place. Avoid using high-temperature settings when clothes are not that dirty. Water that is 140 degrees uses far more energy than 103 degrees for a “warm” setting, but 140 degrees isn’t that much better for washing purposes. Homeowners who take the initiative to make these changes usually discover that the energy savings are more than worth the effort. However, you should consider that inspectors can make this process much easier and perform a more comprehensive assessment of energy saving potential than you can. Ask the inspector if they are trained in performing energy inspections. This is my first post to this blog. Actually I have never done a blog or followed one. So with that we shall begin. I am a Home Inspector in Denver, CO. My company is All Points Home Inspections. I will be posting various things here from time to time such as home maintenance tips, Inspection news, Real Estate information and who knows what else. If you have any suggestions please don’t hesitate to let me know. Of course the main focus of this blog will be how I can help you with your home. Take a look here from time to time to see what is new.